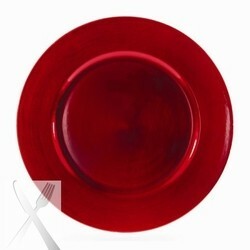 Ten Strawberry Street Lacquer Round Red Charger Plate 13"
Home > Products > Ten Strawberry Street Lacquer Round Red Charger Plate 13"
Use the Ten Strawberry Street Lacquer Round Red Charger Plate 13" to add a pop of color to your table setting. Perfect for enhancing table decor at your high-end venue, this vibrant red piece provides an excellent backdrop for white dinnerware. Providing the perfect harmony of style and practicality, this charger adds a luxurious touch to any setting without breaking the bank. A versatile accessory, it also catches spills and mess to protect your tablecloth. Made from high quality lacquered acrylic, this product is exceptionally durable for long lasting use. Hand washing is recommended to properly clean and maintain this eye-catching charger plate.